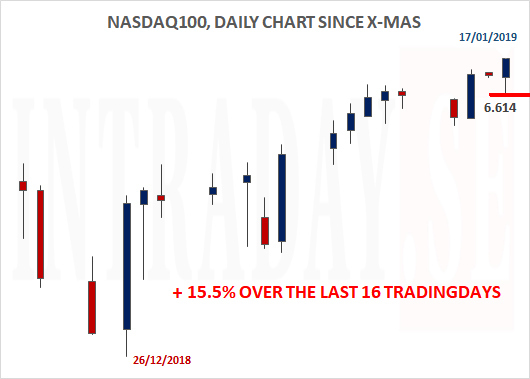 Nasdaq100 has managed to move + 15% since x-mas, but is still - 10% from the October 2018 All Time High. 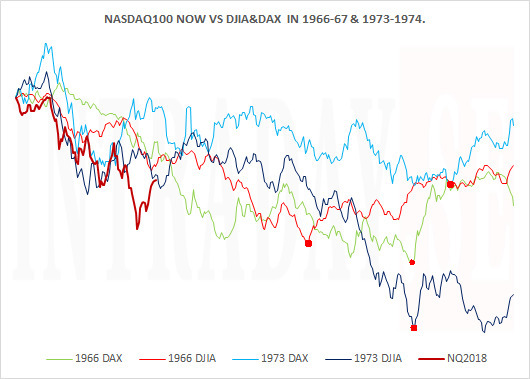 Updating the present longer term chart and comparing it to how the DJIA and DAX performed in 1966 into 1967 and 1973 into 1974, - it seems that markets next fase is more likely to turn lower over the next 135 to 170 tradingdays. The 4 Red Dots are marked by the respective periodical lows, and shows us that 'if these market-maps are guides', a first potential low for Nasdaq100 will be in about 135 tradingsessions (66-67 DJIA) from this Monday 11th of Feb.. 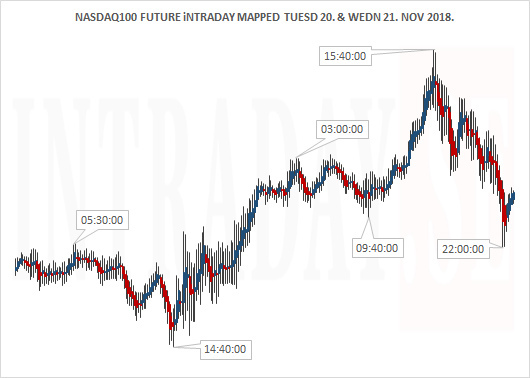 Most similar to the present price action developing from the October 1st top, continues to be the 73-74 DJIA scenario - with a lowpoint about 147 tradingdays away, and - 30.5% lower than yesterday Friday close. According to the market-map from 1973 - 1974, there should now be about 4-5 tradingdays more before 143 trading-sessions of sliding..
Time to get back to earth. The Nasdaq100 index is now up 15.5% since x-mas (see daily chart below). This means the index has retraced back 50% of the 60 tradingdays downturn from October 1st at 7.700 peak to the December 26th low, in just 16 tradingdays. The last 4 weeks shows higher weekly lows, and higher weekly highs. A healthy sign of real strength. Tomorrow is Friday, the last tradingday of this week. Friday is traditionally a weaker tradingday for this index. Any pullback below todays low @ 6.614 is the first signal lower prices potetially to come. Only time will show further direction. Remember to always keep a preferred stop loss in place to limit your downside. Looking at history, reseach shows that stockmarkets could be far away from their end to current downturn. It seems that the October 01st 2018 top was spot on for now. The graph below gives you the perspective. In February of 1966 the DJIA and DAX started trending down to bottom around the new year of 1967. 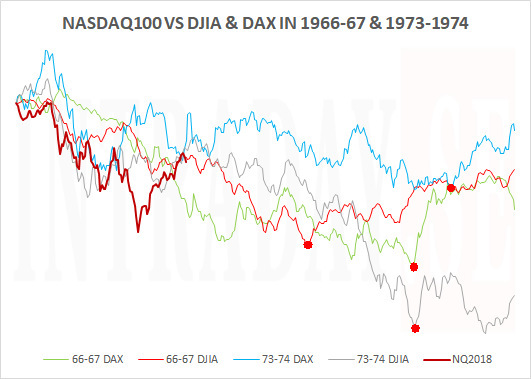 In late October of 1973 DJIA and the DAX indices started the downturns ending in October of 1974. Putting these downtrends into perspective, there are now between 154 and 189 intradays to go from present levels until markets could see their low points. These are marked with RED dots in the chart below. 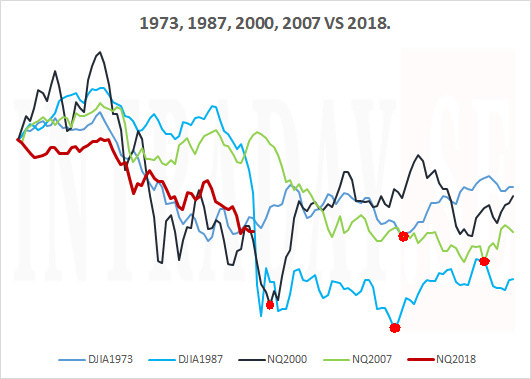 By continuing to follow the DJIA path for 1973 into 1974, markets should not rule out prices - 30% lower than present levels this October of 2019 for thereby to be retested in December. 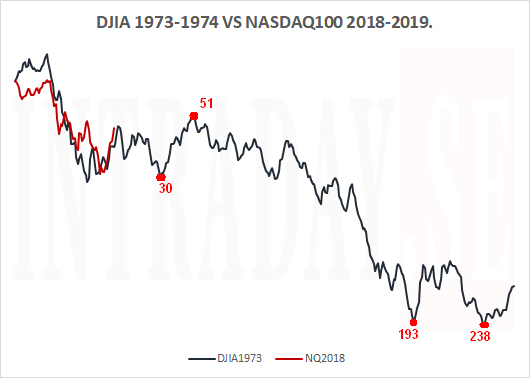 After the last strong intradays, here is an updated chart vs the map of DJIA 1973-1974. 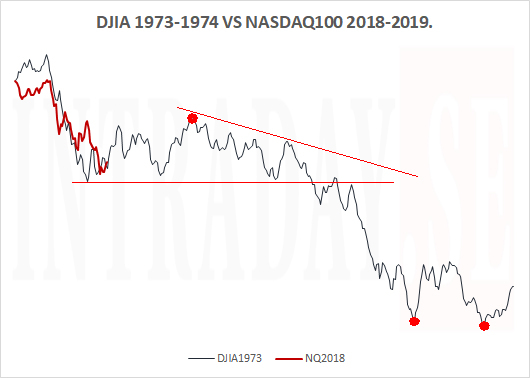 Nasdaq100 do continue to follow the 1973-1974 map of DJIA. Over the next period, markets would now see a lowpoint in approx. 30 intradays from yesterdays close. Thereafter, rising prices equivalent to + 5.3% compared to yesterday's close . In time - in 51 tradingdays. From this point, markets could start the 143 days downtrend to mark its lowpoint in the beginning of October 2019. This slide may be counted as a fall of - 34%. Only time will show if 1973-1974 proves to be the most 'correct' historical path. 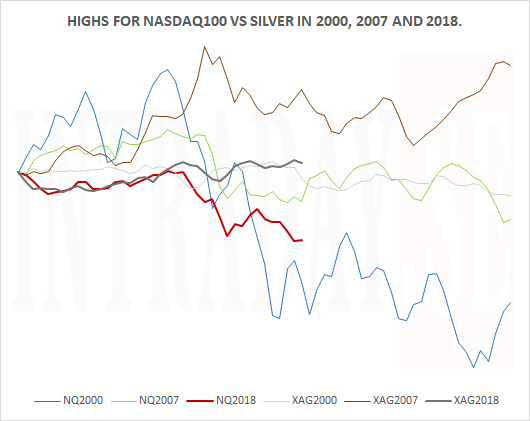 Below is the Nasdaq100 index up against the price of Silver. A ratio is created to see the relative present values. The All time high for the Nasdaq100 index is marked by the vertical line for a broader perspective. An interesting observation about 1973 into 1974. - The Nasdaq100 index will see a broader consolidation fase (or stay relatively unchanged) from present levels until the second week of June of 2019. But - over the coming 55 tradingdays, markets will see an upturn of + 9.5%, and thereby slide -34% over 143 tradingdays into its first week of October of 2019. That October 2019 low, will be retested one percent lower 45 intradays later, in early December of 2019. The periods mentioned are marked in the chart above with red dots. Passed performance do never equal future performance. 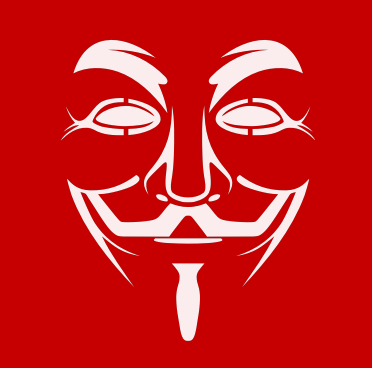 A few days ago, the 16th of November, this post was put out for the Nasdaq100 index. 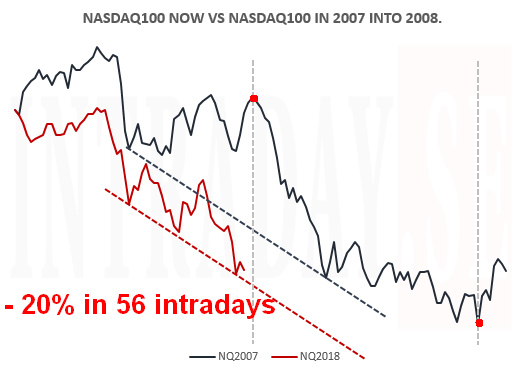 Continuing the conversation about the Nasdaq100 development, the big question is IF the index now will continue to follow the 2007 route (see graph below), or - if it will drop straight through the floor (red support line) and outpace the 2007 into 2008 downtrend. The two red dots marked in the dark graph below shows a fall of 20% in 56 tradingdays. For the present red graph to follow this map more closely, the index should preferrably bounce in the beginning of this week, for thereby to start the real - 20% drop about Thursday the 29th of November to last 56 intradays. The red dots marks the low point of its respective downtrends. Calculated from Fridays close, you will find that the DJIA development in 1973 is 2.7% lower in 36 tradingdays. The DJIA in 1987 is 21% lower in 34 tradingdays. 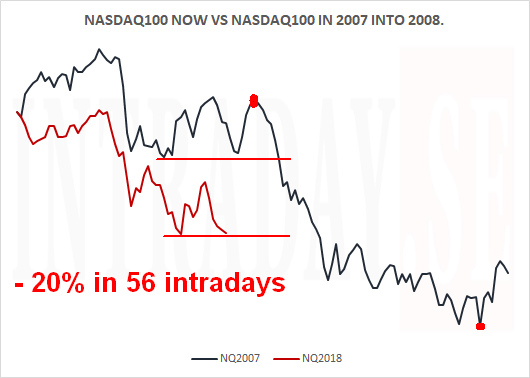 The year 2000 for the Nasdaq100 index equals 10% lower in 4 days, and the Nasdaq100 in 2007 is 20% lower in 56 intradays. 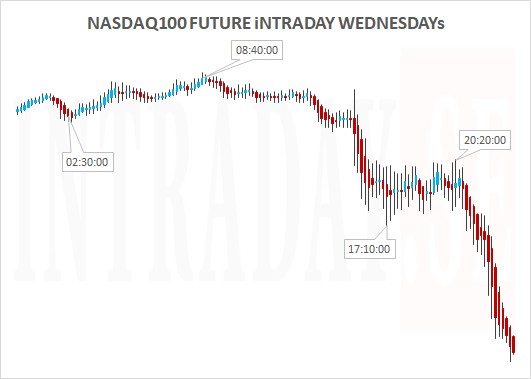 The Nasdaq100 Future index has proved to show strong Tuesdays since this summer. This is the strongest intraday of the entire week. Wednesday is the weakest. Below is a map sited for the next two intradays after analysing marketdata. Looking at past performance for tomorrow and Wednesday, markets could start buying into a rebound rally lasting from about 14:40 CET Tuesday into the US open Wednesday 15:40 CET. Remember to always keep a preferred stop loss in place, and remember the average daily range for the index (not to be stopped out at the 'wrong' level). Timewindows may be a time of the day where prices make solid turnarounds, pause or accellerate an already existing trend. The picture may also act inverse to what you see (a low could be a high and high could be a low). By entering or exiting around a dedicated timewindow you may acheive a more optimal price, by foreseeing a potential support and resistance level. Here is a large image of the Nasdaq100 Future index above. Will Nasdaq100 soon drop 20%? 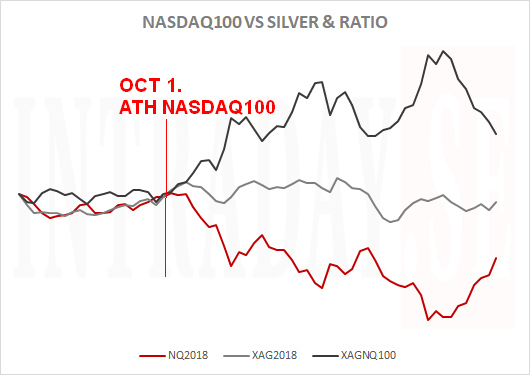 From the recent market peak October 1st, we have compared the Nasdaq100 index to marketmoves in 2007, 2000 and 1987. 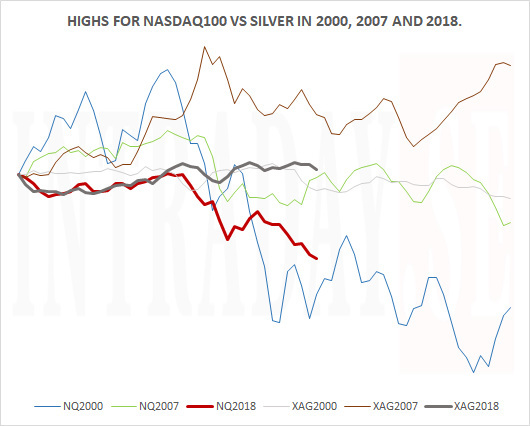 If you are taking a closer look at the Nasdaq100 index peak for 2007 trading into 2008, you see high correlations to the present market situation. See chart below. Transferring the 2007 points to the present situation, the first red dot would now be placed on next next Tuesday the 29th of November. A second red dot will be placed 56 tradingdays later and turn out to be about 15th of January 2019. The red hoisontal lines are set to show the importance to the supportlevel from 29th of october this year duplicated from the 2007 supportlevel. A daily close below this area is quickly a confirmation of weakness. Only time will show is this route is the present correct map into 2019. Nasdaq100 could fall further before next bounce. 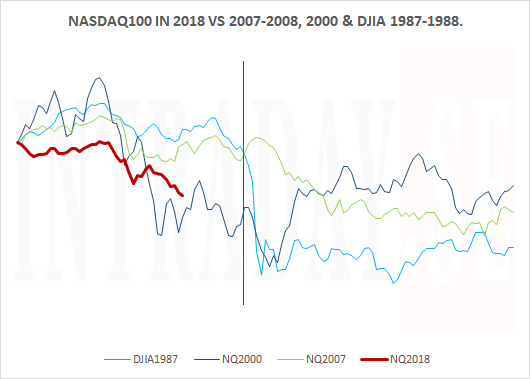 The Nasdaq100 index bounced off its lows at the turn of the month, and now looks to possibly continue its weakness (vs the 2007, 2000 and 1987 peaks), after consolidating the first real move down from its recent all time high October 1st. The index future is down 10.9%. If the 2007, 2000, and 1987 peaks are still comparable to present price development, current weakness should bring the market(s) quite a bit lower within at least the next 9 trading sessions. Thereafter, the index should consolidate the move for a while. Nasdaq100 Mond 05. & Tuesd 06. Nov. 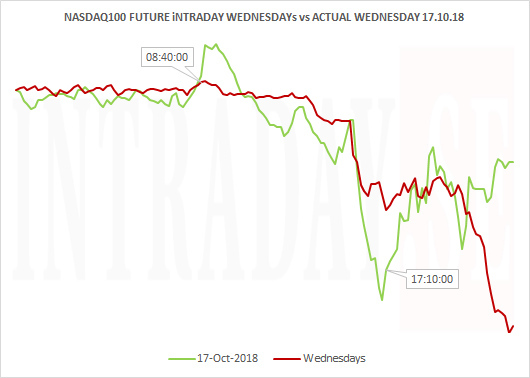 The Nasdaq100 Future tends to trade stronger through parts of the European session on Mondays (the last couple of months). The index then drifts lower towards the close of the US stockmarket session. Monday has been the second weakest day of the week lately (after Wednesdays). 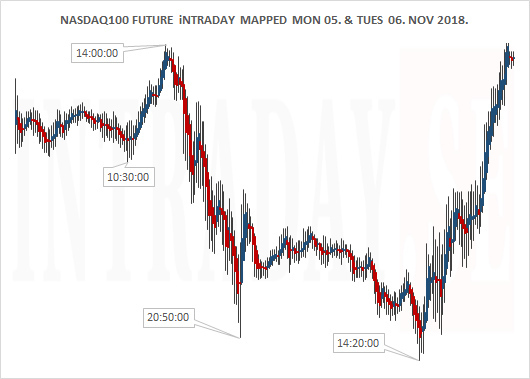 Below is an intraday chart mapping Monday and Tuesday's potential developments. Tuesday is trading weak until European afternoon, for then to trend smoothly throughout the US stockmarket hours. Tuesday shows to be the strongest day of the week lately, and negative sessions are few and only marginally into minus territory. Designated timewindows are set to optimize entry and exit levels for positions. Remember that a timewindow could be where prices turns around, but it can also be where prices pause for then to continue or an already existing major or minor trend. When invested, always keep a preferred stop loss in place to limit losses. 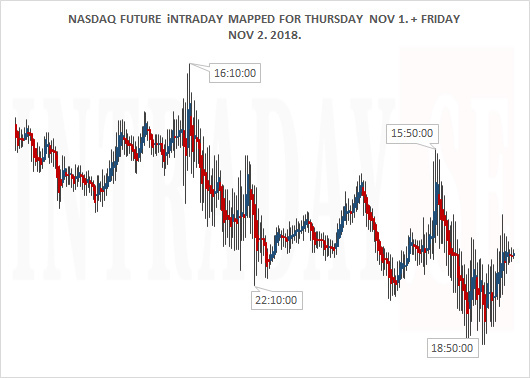 All four mapped timewindows proved to act as significant timezones / timewindows for the two actual tradingdays (Support to price, pause or resistance to price). The question is if the turn of the month for August, September and October could tell anything about the coming trading patterns for the 1st and 2nd tradingdays in November? 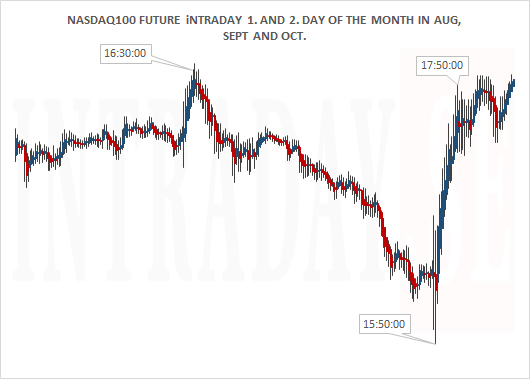 Today's 10 minute bar chart has put these three months into one graph for the Nasdaq100 Future index. Displayed below are the intradays patterns for the first and second days of the last 3 months. Looking toward to todays and tomorrows trading sessions, the chart above shows that a timewindow could be seen around 16:30 CET Thursday, for then to trend until 15:50 CET on Friday. Only time will show if this 'beginning of the month map' is a relevant tradingroute for this Nov 1st and Nov 2nd. On the other hand, a different chart is mapped below. This is an ordinary intraday analysis for Thursday and Friday this week. Compared to the 'beginning of the month map', this intraday chart below, actually signals turningpoints for silmilar timewindows. First, Thursday around 4 PM CET, then Friday around 15:15 CET. Only time will show if these charts are any 'good' trading maps for today and tomorrow. 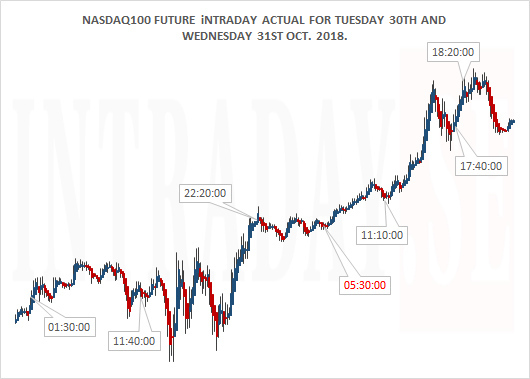 Nasdaq100 Tuesday 30th / Wednesday 31st. Markets are getting closer to a new tradingmonth, and the upcoming last two intradays of October may be volatile. A map for tomorrow's and Wednesday's intradays are presented in a chart below. Only the time will show if there is reliability to the patterns and timewindows outlined. All timewindows are CET. A lager and clearer image can be viewed here. 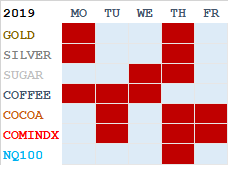 The last months shows Tuesday to be the strongest intraday of the week, and Wednesday the aboslutely weakest. ...and below is the actual intraday development for Tuesday and Wednesday. The 05:30 timewindow highlighted in red shows the importance of time to change in course of price. 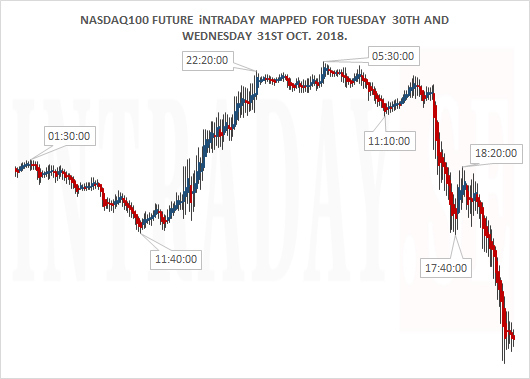 The map outlined on Monday for Tuesday and Wednesday showed 05:30 as a 'high', and the actual market viewed this as a 'low' (for thereby explode to the upside). In other words a total inverse relationship. 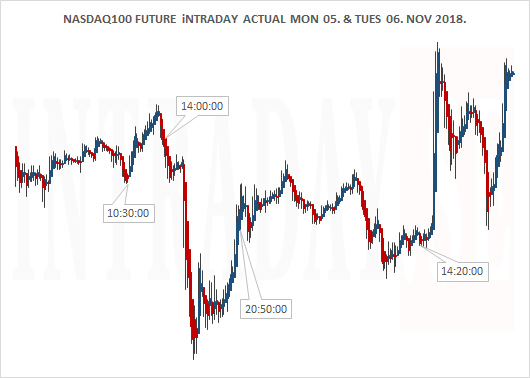 The actual Nasdaq100 Future chart does in this case behave inverse in relation to the map. This gives an example of how important a timewindow could be. Remember to always keep a preferable stop loss in place to limit potential trading losses. 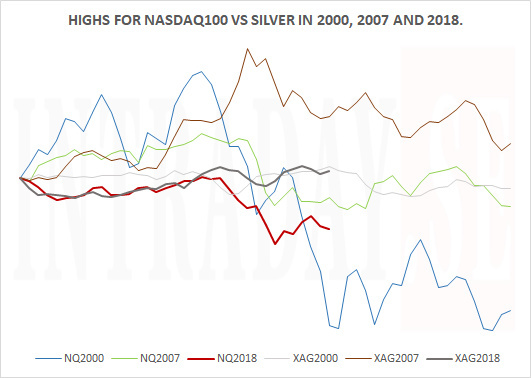 This chart displays how the Nasdaq100 index and Silver performs these days - compared to the Nasdaq100 peak in 2000 and 2007. This story continues as a followup few intradays after the very top this year October 1st. The Nasdaq100 index is presently down 10% from its peak, and looks to find a temp. bottom quite soon (if comparing the peaks of 2000 and 2007), to trade sideways before heading further south again. Markets are dynamic, and only time will show if history is 'repeatable'. Silver is holding up strong and the question is - if it could start a new uptrend withing the next 15 intraday sessions as in 2007? See chart below. Nasdaq100 peaked 14 tradingdays ago and closed yesterday (Friday) down 6.7% from its recent high. Silver holds up in comparison, and is + 0.4% over the same period. Similar to its topping developments in 2000 and 2007. 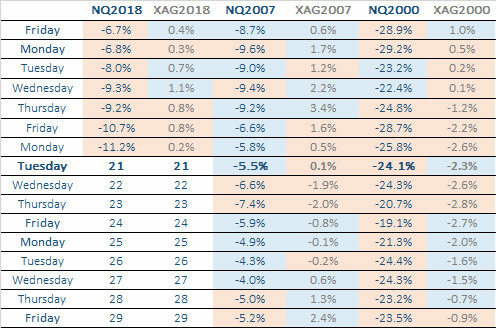 Below is a table showing the price development post the highs in 2000, 2007 and in 2018 for both Silver and Nasdaq100. Coming Monday is tradingday 15 from the recent Nasdaq100 high and this Monday shows weakness in 2000 and 2007. Silver shows a strong Monday in 2007 but a weaker 2000. Throughout the week Nasdaq100 could show some recovery. Only time will show how week 43 in 2018 will fit into this next weeks table. 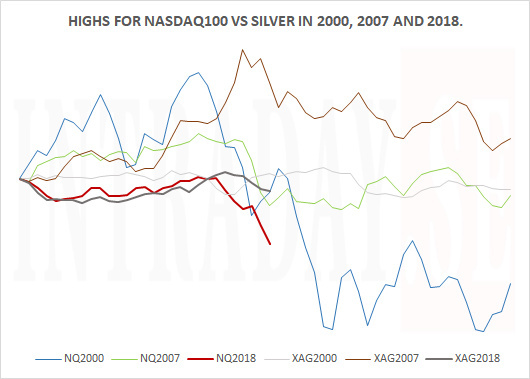 Below is an overview of how Nasdaq100 and Silver stands today up against to the major Nasdaq100 peaks in 2000 and 2007. 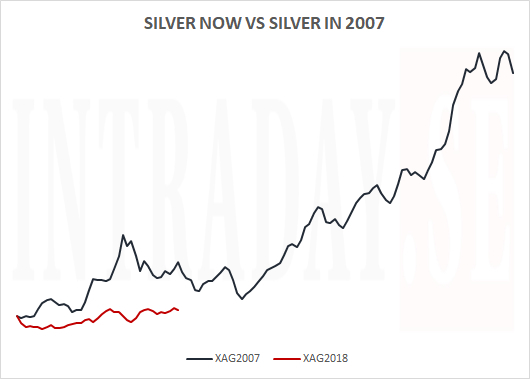 Now looking at the present market situation vs a potenially state in 2007, research find that a major uptrend for Silver could start within the next 20 tradingdays. See chart below. This major uptrend lasted for 3 months in 2007 into 2008. 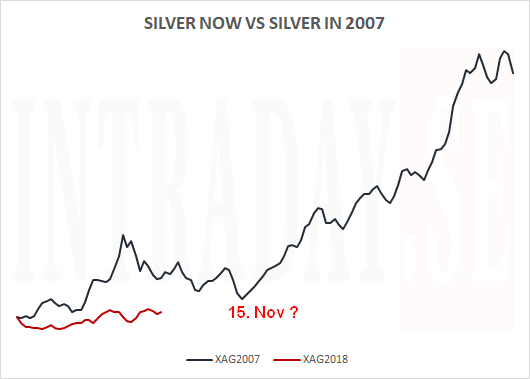 If a similar situation is about to take place, this next leg up for Silver should last from mid November to mid February 2019. Looking at the Nasdaq100 index from 2007 and into 2008, markets trended sharply downwards. 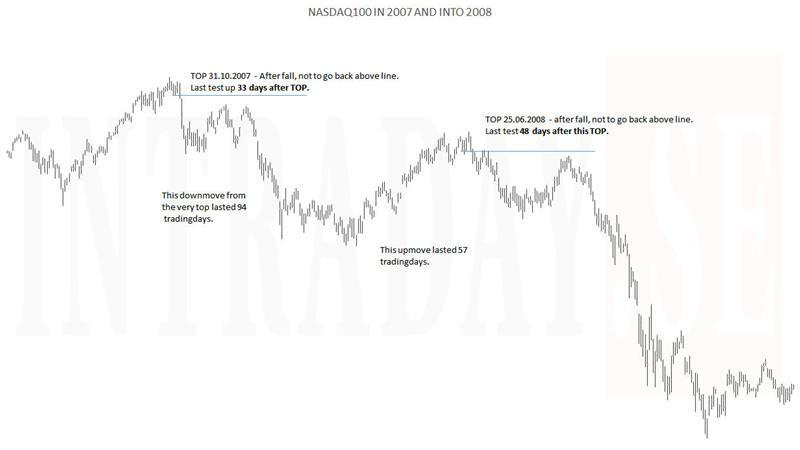 The major move from the very top lasted from 31.10.2007 to 17.03.2008 equal to 94 tradingdays falling 25.4%. The majority of this downtrend lasted only 19 tradingdays from 26.12.2007 to 23.01.2008 showing a 20% fall. Nasdaq100 continued to fall today as Silver recover. 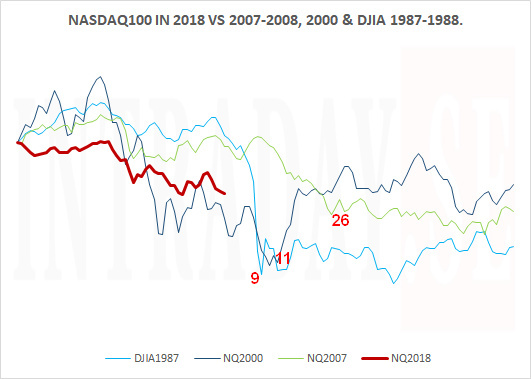 According to the table below (see Wednesday for explain), Nasdaq100 could recover or flatten out Friday if comparing to the 2000 and 2007 peaks. If the table is still some sort of map, Nasdaq100 index for next week could be flat (as in 2007) or quite downtrending (as in 2000). Only time will show. Below is the ongoing chart comparisons updated after intraday Thursday.